Yesterday, the New Jersey Legislature took the final steps in advancing the Sexual Assault Survivor Protection Act of 2015 (A4078/S2686), which now heads to Governor Christie for his signature. This bill, identified by the New Jersey Coalition Against Sexual Assault NJCASA as its main policy priority, closes a loophole in current New Jersey law – one that prevents approximately 80% of sexual assault survivors for applying for the protections afforded by civil restraining orders. “Thanks to the tireless leadership of Assemblywoman Huttle, Senator Pou, and Senator Beck, New Jersey has passed a critical piece of legislation that recognizes the trauma experienced by survivors of sexual assault. The creation and passing of this legislation is a representation of Trenton at its best. We crafted this bill with the invaluable input of the Attorney General’s Office, the Administrative Office of the Courts, bipartisan sponsors, and the expertise of sexual violence advocates from across the State. Together, we have elevated the voice of survivors and expanded protections so they may heal. We look forward to having this bill signed by the Governor, adding it to the long list of policies New Jersey has adopted to better meet the needs of survivors,” said Patricia Teffenhart, NJCASA’s Executive Director. Together, we have elevated the voice of survivors and expanded protections so they may heal. Once the Sexual Assault Survivor Act of 2015 is signed by Governor Christie, New Jersey will join the twenty-five other states that have passed similar legislation. For more information on the Sexual Assault Survivor Protection Act of 2015, visit our previous blog posts part one and part two. 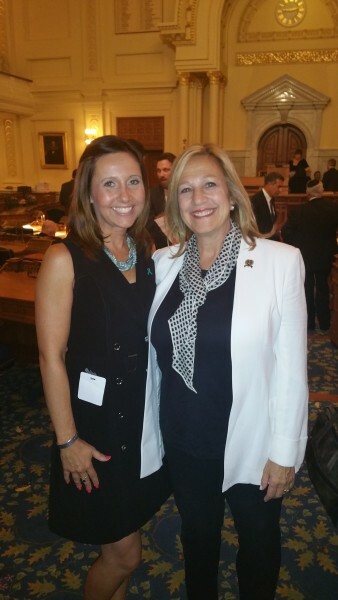 NJCASA Executive Director Patricia Teffenhart & Assemblywoman Valerie Huttle on June 25, 2015.